This is fantastic. Just love it. Have never heard of the Meadowlark - are they similar to the ordinary lark? Beautiful image of him. That made me smile as soon as I saw it! Fantastic photo! Great capture, looks to be singing its heart out! What a pretty bird too. Such joy conveyed in this shot! Beautiful capture! Love the vibrant colors! Shame this picture couldn't come with sound! 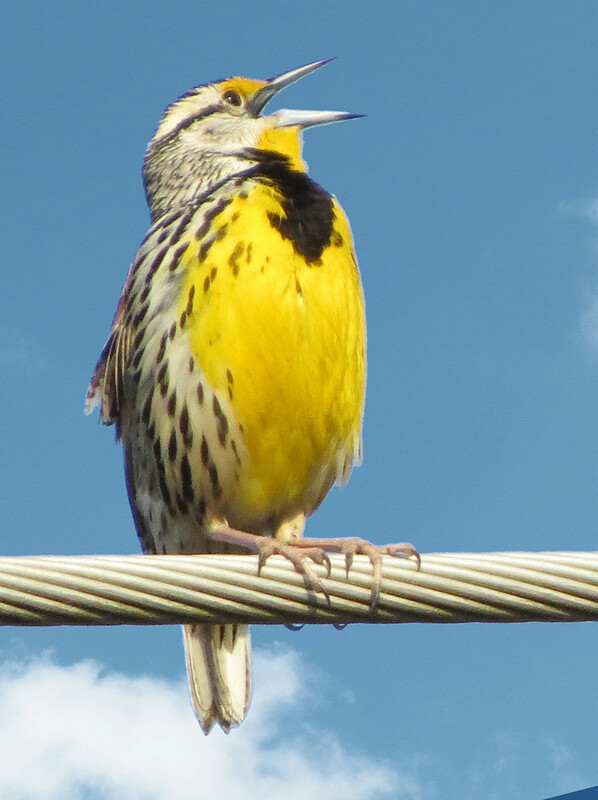 Love your meadowlark photo. They are our state bird - Montana. Amazing detail in the bird and the stands of wire that it is sitting on! FAV! Wow what a beauty Milanie! Wonderful, such brilliant colors, now I have to google that bird and listen to what it sounds like when it sings. thanks you for some spring on a gray Cape Cod afternoon. super capture! Love the open mouth! Great shot- love that you caught him mid-trill. Simply perfect, both capture and bird.